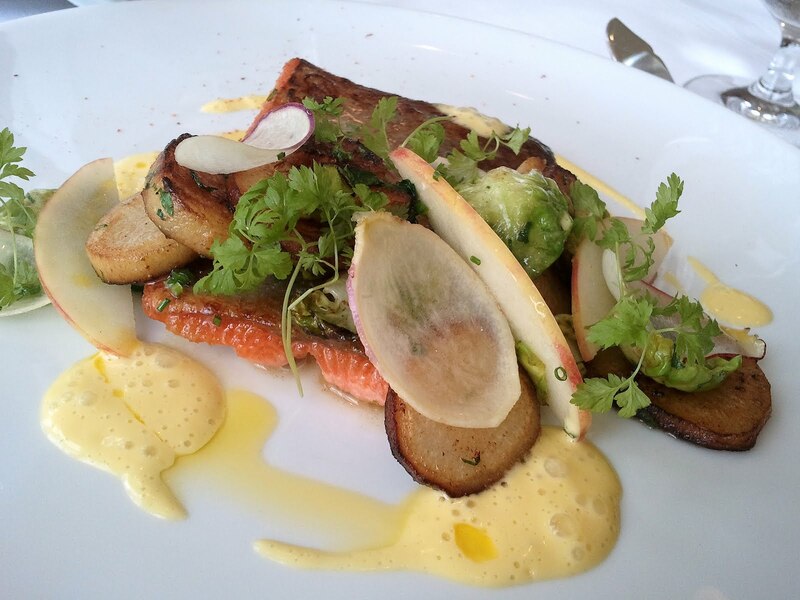 Can Langdon Hall’s Grand Chef Jonathan Gushue Win Gold Medal Plates With Food Like This? 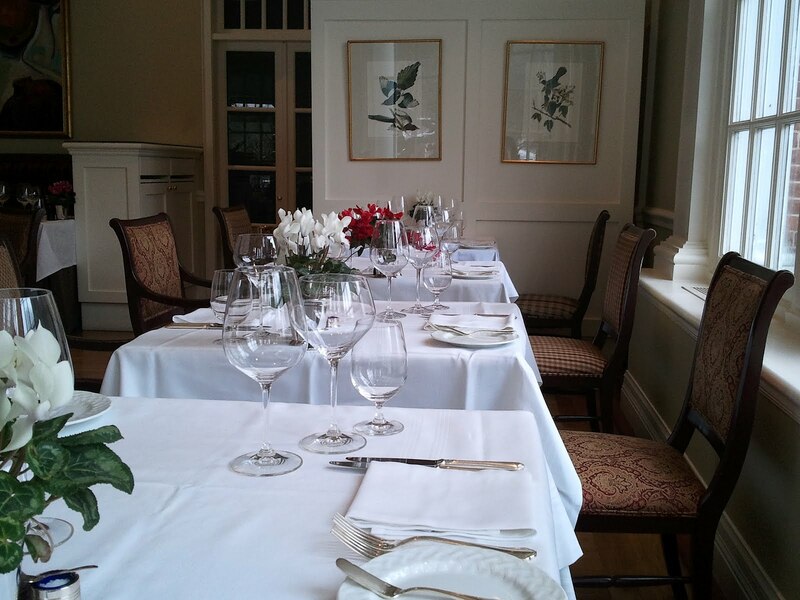 When I dropped into Langdon Hall recently, Executive Chef Jonathan Gushue was exactly two weeks away from one of the most prestigious culinary competitions in the country. 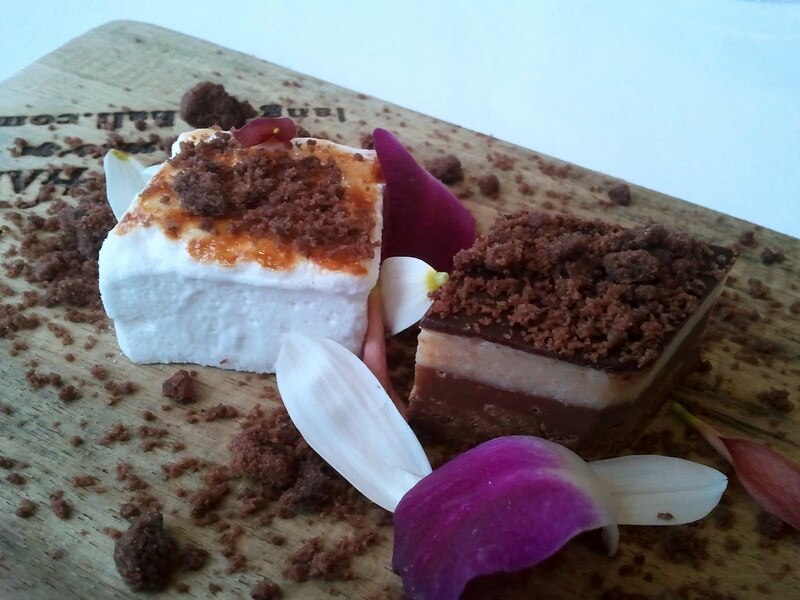 The 2012 Gold Medal Plates Canadian Culinary Championships is taking place in Kelowna, BC this weekend. The event spans 2 days with a Mystery Wine Pairing (Fri, Feb 10), Black Box Competition (Sat, Feb 11) and the Grand Finale (Sat, Feb 11). The nine chefs participating were chosen at regional competitions held throughout October and November of 2011. I am particularly curious about this year’s match-up because of such nationally recognized competitors as Chef Gushue and also Chef Rob Feenie from Vancouver. I also feel that our representative from the November 14th event in Ottawa will be a force. Chef Marc Lepine opened his restaurant, Atelier, only 3 years ago and was quick to receive accolades for his creativity with tastes and techniques, being named 4th best new restaurant in Canada by Air Canada’s enRoute magazine. 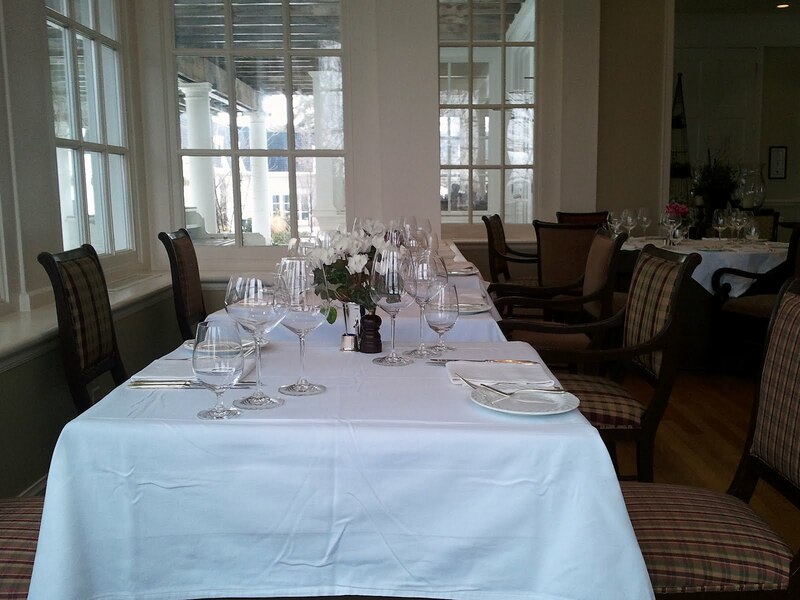 But instead of packing my bags for the west coast, I decided to hedge my bets with the potential 2012 champion and dine quietly in the sanctuary of Chef Gushue’s dining room, away from the pressures that await him in the kitchens of Kelowna. When you enter the over 100-acre estate of Langdon Hall in the outskirts of Cambridge, Ontario’s downtown core, you easily feel transported to a place far from your day to day life. 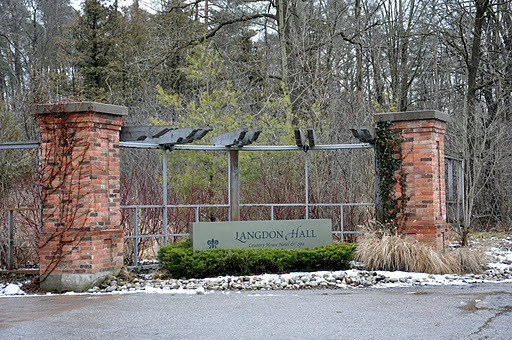 Langdon Hall was built in 1898 and still maintains the stature and the architecture of that time. There have been some additions to the main home, as well as outbuildings constructed when the property was established as a hotel and spa in 1989. The main dining room has two major wings, essentially identical. I strategically chose a Friday lunch in the hopes that it was a ‘swing day’ with week long corporate guests leaving and the weekend leisure crowd yet to show up. With luck, the dining room would be more quiet and my moment of respite heightened, allowing me to linger over every bite. They spoiled me. 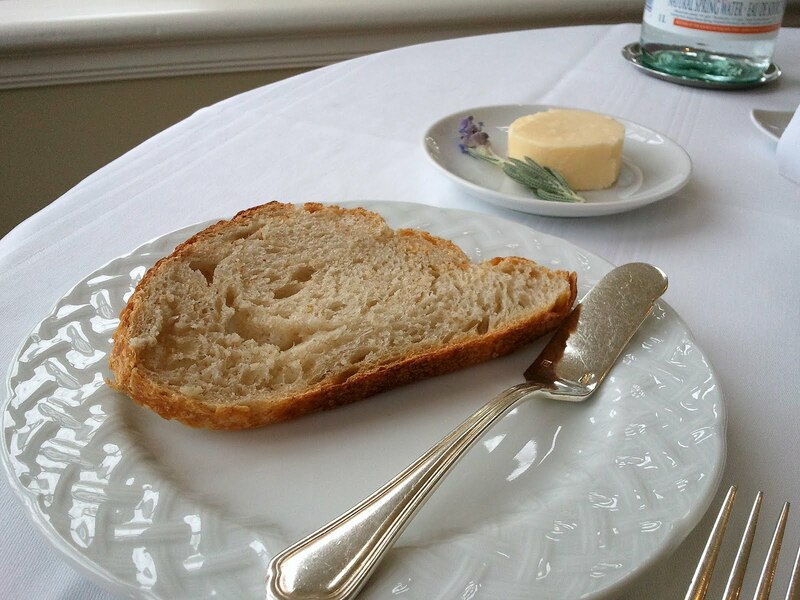 As the other guests shared the one wing of the dining room near the conservatory, I had the other large one all to myself. Jessica Pearce, Marketing & Public Relations Coordinator, is quite a sleuth. She was quick to knit together hints of scattered information to establish that I was in the house, although I made no grand announcement of my arrival for lunch that Friday. One of the excellent staff serving me made reference to my blog post on Chef Gushue at Savour Stratford. Specifically my supposition that his brilliance was due in part to being of the left-handed set. Oh, oh. I had been outed and I sensed I was about to be spoiled. I can only assume that what would unfold before me was an acknowledgement of my known appreciation for his fabulous work, shown by my willingness to travel some 500 kms just to lap up the experience. 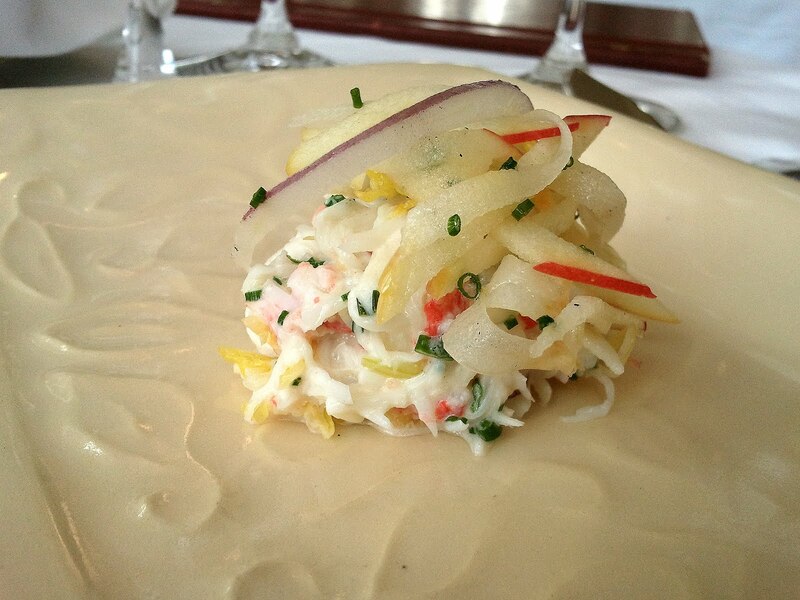 Top-notch service and the finest of food preparations are not something that can be ponied out for a special guest. You either have it or you don’t. This is a place of very fine dining. There were no missteps. I just hoped my own manners could keep up to protocol. 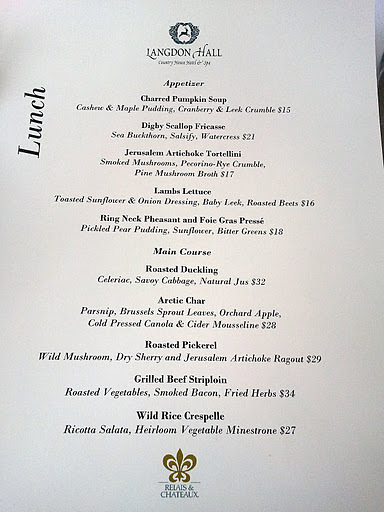 The lunch menu was extensive. For my appetizer, I was torn between the tortellini and the scallops. Knowing seafood would be my main, I went for the pasta. The first surprise treat was a pinot noir based sparkler from Hinterland Wine Company in Prince Edward County. I unfortunately was sporting a bit of a headache. This was going to cure me or push me to the edge. 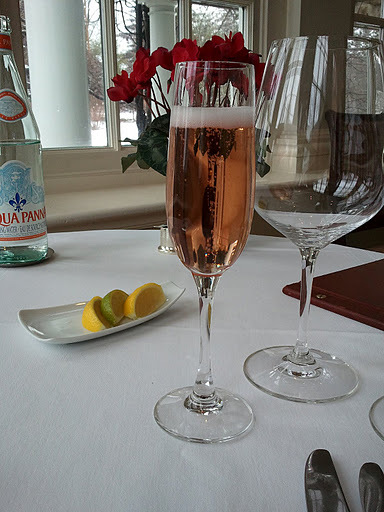 It was refreshing and light and proved to be a decent match as I very slowly sipped away at it throughout my meal. 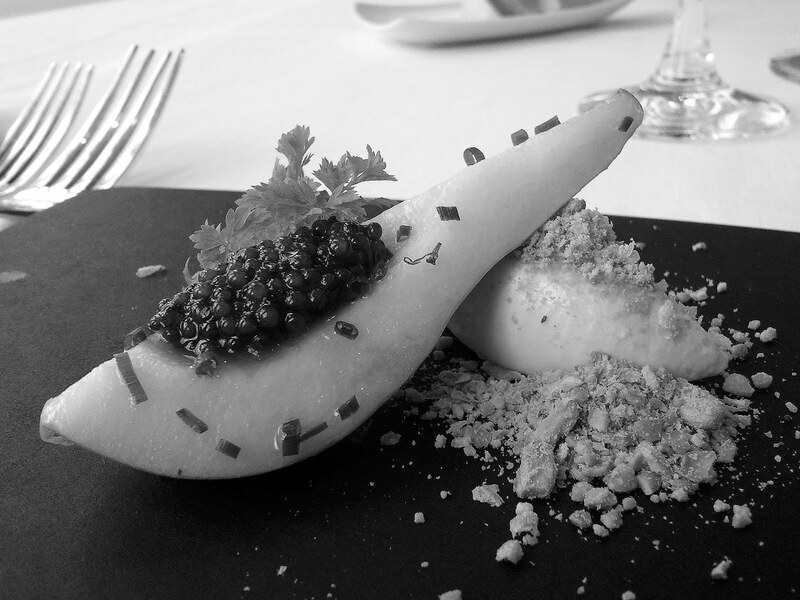 The amuse-bouche was a banana pear marinated in shallot vinaigrette with sturgeon caviar, a quenelle of crème fraiche, and garnished with a sunflower seed crunch. It was as delicious as it was visually stunning. 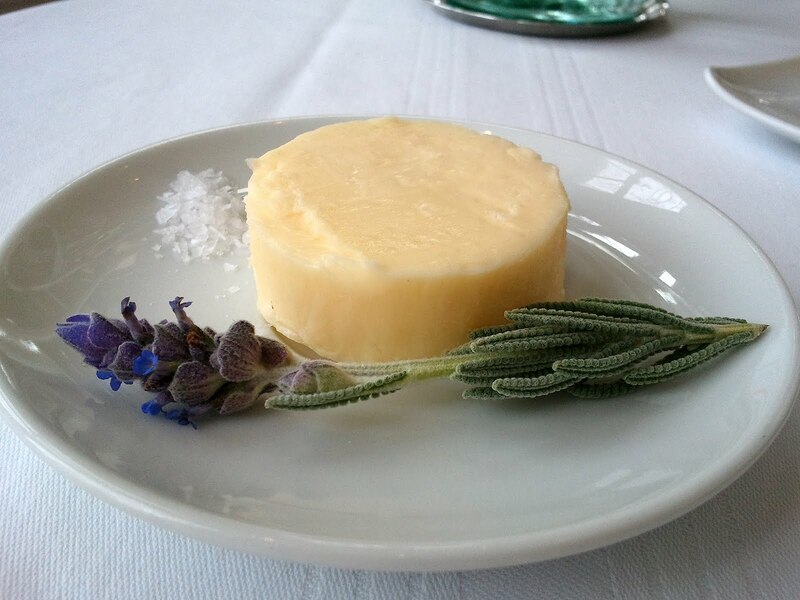 The butter is made in-house. 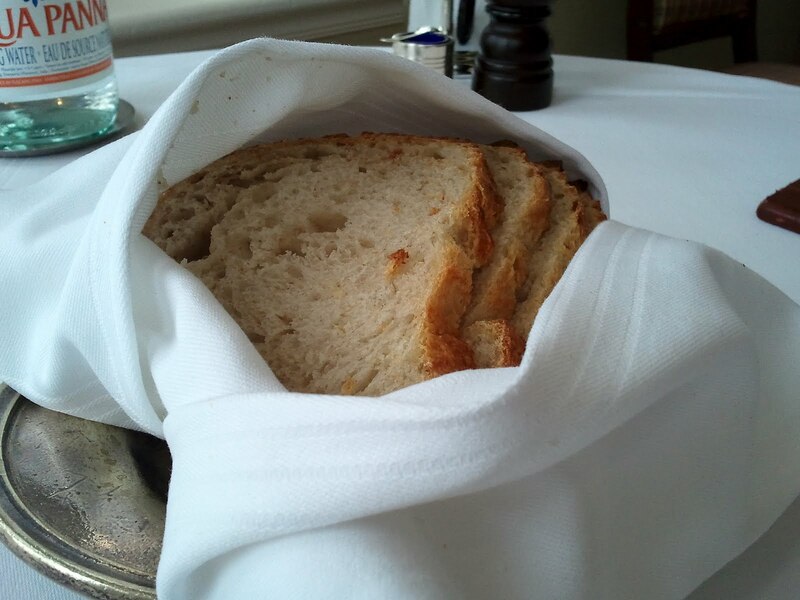 As is their sourdough bread. A beautiful crunchy crust with a soft, fresh, chewy centre. My appetizer was the Jerusalem artichoke tortellini with smoked mushrooms, pecorino-rye crumble and pine mushroom broth. 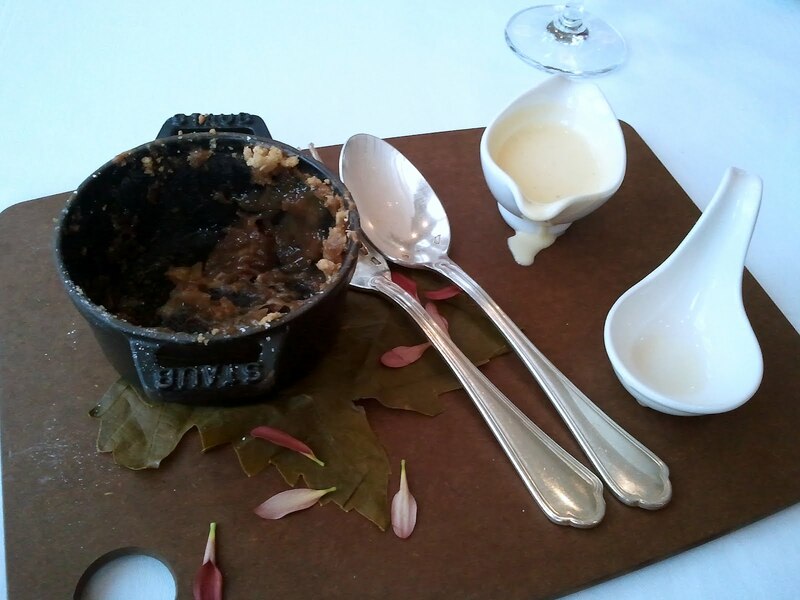 The scent of the smoke wafted up from the mushrooms, only to be enhanced when the broth was poured in at table-side. 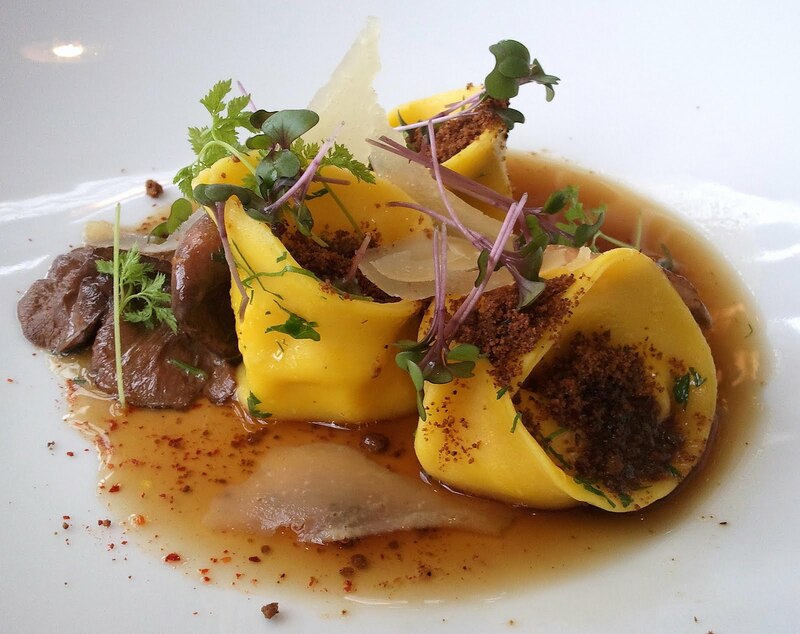 The sweetness of the rye crunch brought life to the mellow flavours in the tortellini. This dish was a hit. I appreciated the spoon nearby but struggled with the wide bowl to capture every drop. Good manners kept me from stealthily lifting it to my lips. Another surprise treat followed. 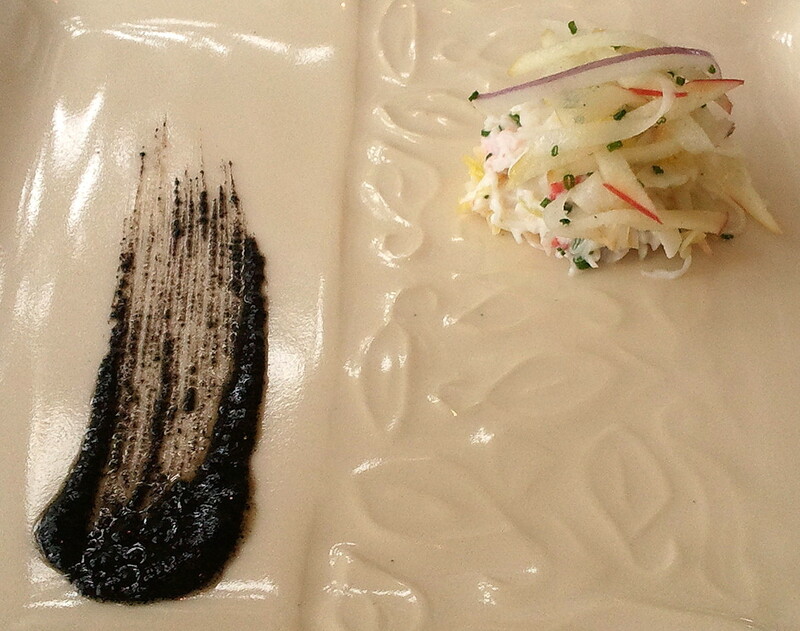 Snow crab in goat’s milk yogurt, topped with a slaw punching with the brightness of apple and the bite of red onion. I pushed each morsel through the smear of the leek ash vinaigrette. Then on to the main. I hesitated on first bite. Was the fish overdone? It turned out to be just a crispy corner. The handsome portion was cooked to perfection. The mild flavour and dense meat has a way of camouflaging the high fat content. It balanced well with the earthy brussels sprout leaves, roasted parsnip medallions and slices of orchard apple, all brought together with the kitchen’s signature cold pressed canola and cider mousseline. A consistent theme with Chef Gushue’s dishes is the harmony of layered flavours and textures, but also the mellow taste on the palate. You are at the symphony, not a rock concert. I struggled with the dessert menu. Classic dishes for sure. Lots of ‘sweet’, ‘chocolate’, ‘rich’. But I was craving ‘refreshing’, ‘light’, ‘tart’, ‘tangy’. 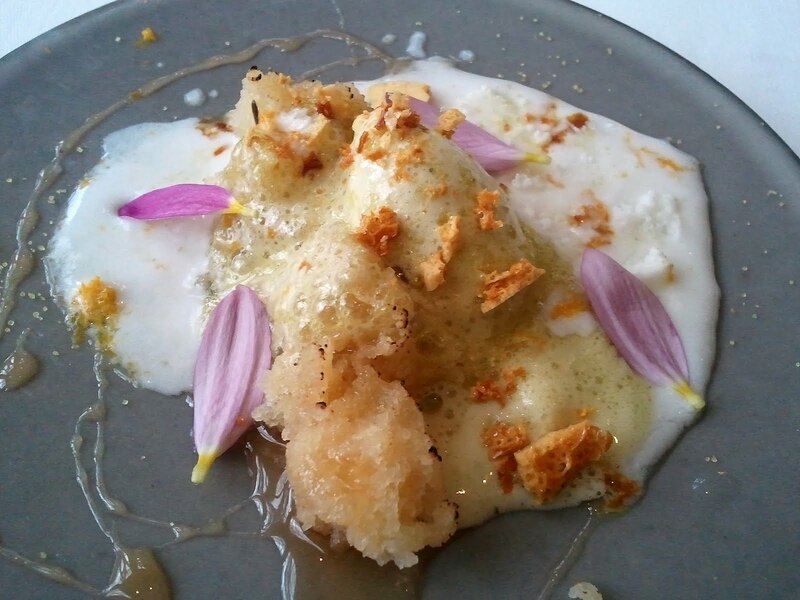 I had my sights set on something similar to the work of pastry chefs Patrice Demers of Les 400 Coups in Old Montreal or Michelle Marek, formerly of Laloux and now co-chef of the Foodlab at SAT in Montreal. 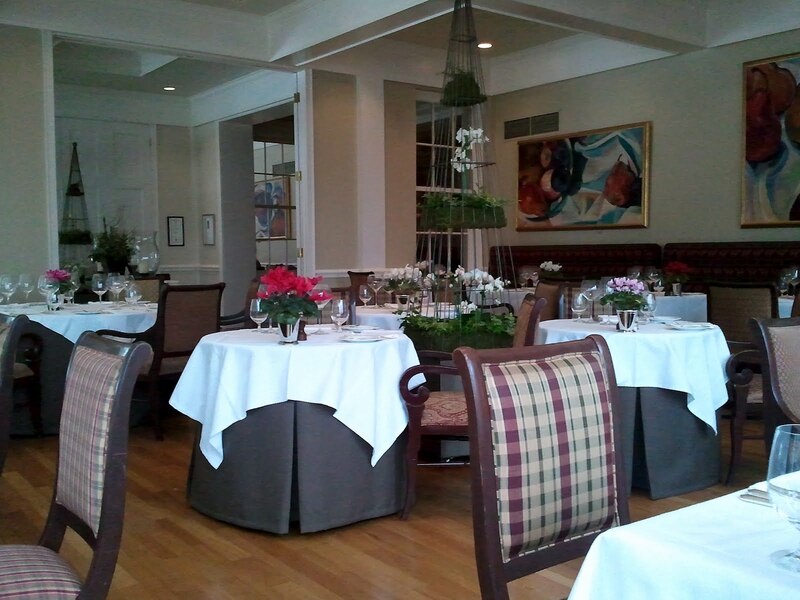 (Les 400 Coups was named 4th best new restaurant in Canada by Air Canada’s enRoute magazine 2011. Patrice’s work was noted, rightfully so.) I still think of Chef Demers’ ‘Vert’ with green apple, pistachios, olive oil, cilantro. yogurt. Chef Marek’s cardamom panna cotta with carrot sorbet had me returning to Montreal for a second visit. Is this just the dichotomy of ‘cosmopolitan’ and ‘country estate’ settings? I digress. 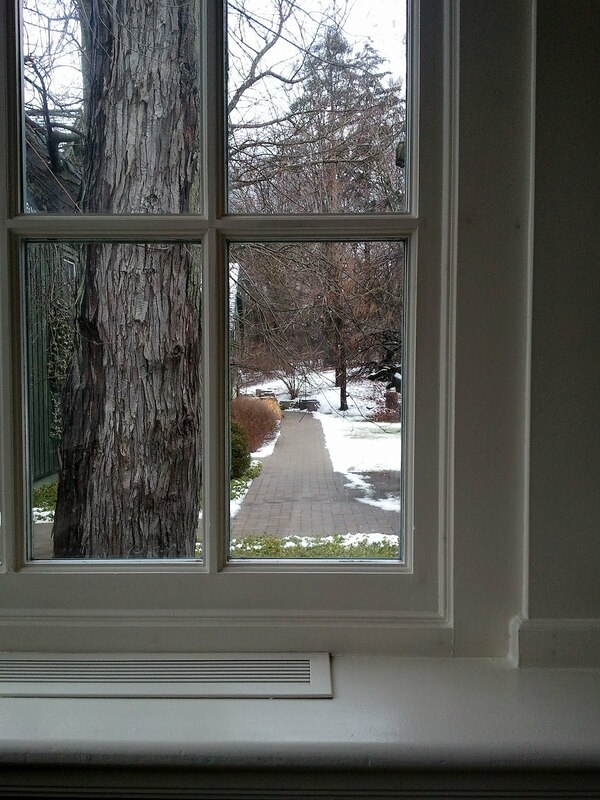 The Langdon Hall orchards and kitchen gardens were calling me. 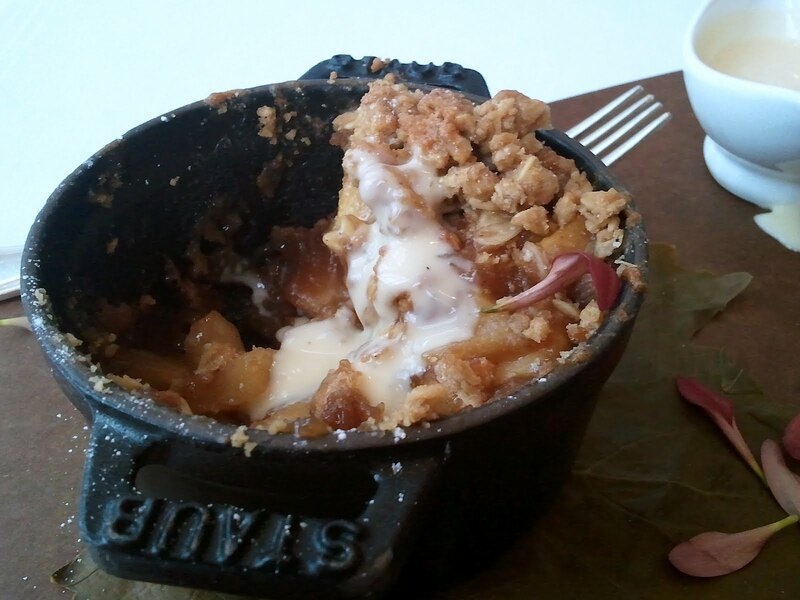 I narrowed my choices to the carrot cake and the apple crisp, then committed to the latter. But the surprises continued. A pre-dessert! The zest of orange and the citrus yogurt dressing lightened the sweetness of the pine scented marshmallow and cake pieces which was topped with crumbles of sponge toffee. And now my dessert-dessert. 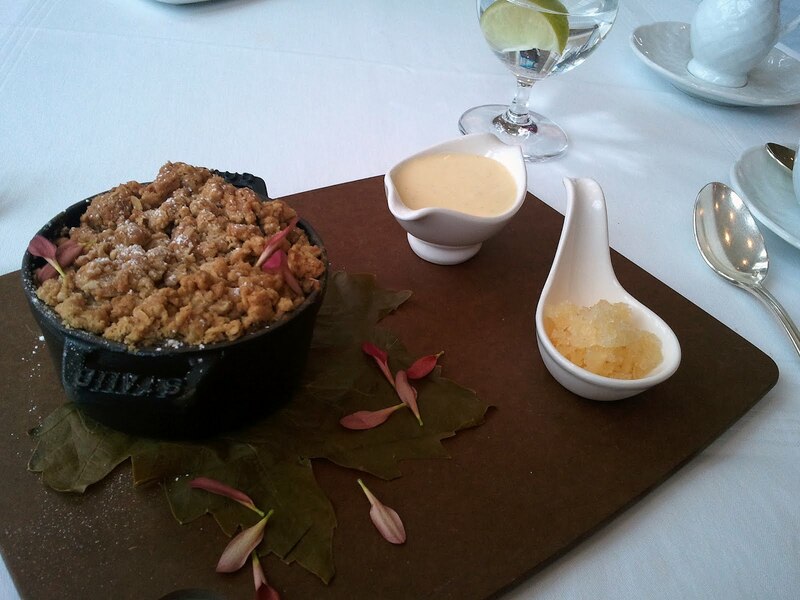 I had no idea what to do with it all and my most supportive server informed me that a popular plan of attack is to trench the wild ginger and honey apple crisp, then pour in the icewine anglaise. I obliged him. My cider granita melted away as I worked the sweet, cinnamony, apply crisp (too sweet for me – well, not so sweet that I didn’t finish it). I drank my granita as a chaser. At this point, I settled into my cup of Starbucks coffee as I threw in the napkin on one fantastic lunch. But wait. There is more! By now I am starting to blur with all the goodness. 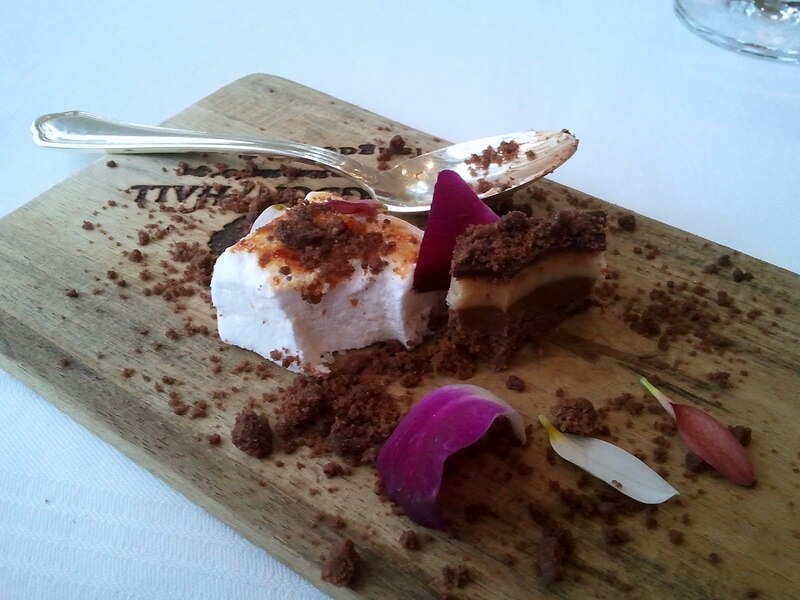 I hear words like petit fours, in-house marshmallow, hazelnut, Picard’s peanuts. They may have even said brownie crumble. I tasted the delightful surprises against my better judgement of fullness. Victory was theirs. Mission completed. 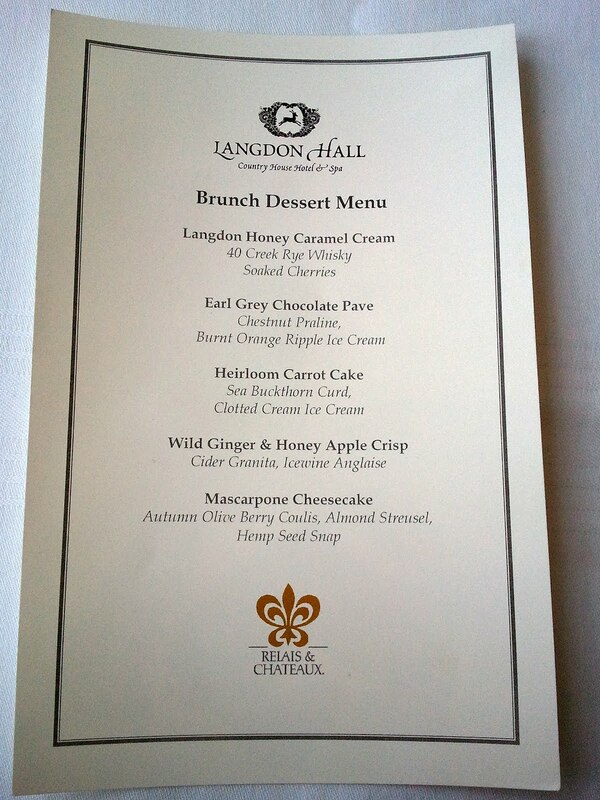 I had my quiet getaway lunch, retreated in the idyllic woods of Langdon Hall, in the best of care of their capable kitchen and the first class team at my service. I like that Gushue sources so much of his raw ingredients from the property. Of course, there is an extensive kitchen garden. But they also tap the trees to make syrup. There is now an apiary for their own honey. I hear there is one grand smoker new in the chef’s toolkit. I think my mushrooms had a visit there. They forage the wooded property for all things tasty and wild. What’s next? A few vines for their own wines? Or in-house roasting their own beans for coffee? There doesn’t seem to be anything that Chef Gushue won’t try. Partly the challenge to keep the learning fresh and partly a strong desire to be as self sustaining as possible. Chef Gushue’s steely determination, his depth of food science knowledge, his calm and steady focus, his artful play of taste, texture and colour will be definite assets for the Canadian Culinary Championships. With just hours to go before the new winner is crowned, I wonder what he is thinking now in the cacophony of madness they might be calling ‘kitchen stadium’. No doubt he is being a fierce contender. After all, he IS left-handed.